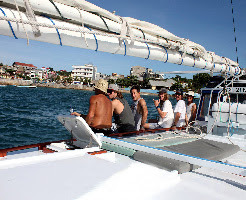 Boat Charter Bali is the ultimate experience for people wanting to cruise Bali in style and comfort. 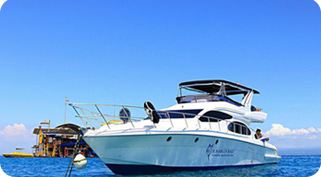 We offer a premium selection of yacht charters and boat rentals in Bali Indonesia. From comfortable day cruisers to large live aboard yachts and catamaran's, our fleet is the best available. We have the highest standards in comfort and safety, and our charter trips and tours are designed to be fun and fulfilling for every passenger. We have a wide range of fully crewed charter options, fishing and snorkeling tours at the guaranteed best rate available. We also offer a range of group snorkeling tours aboard various luxury yachts and cruisers. Take a Bali snorkeling tour around the tropical islands with friends or join a group fishing tour to reduce the costs. Or you could organise your friends to charter a private yacht to discover a hidden paradise in total privacy. Catch big game fish and barbecue the catch instantly aboard a yacht that is fully equipped to meet all your needs. Discover hidden beaches and private reefs, enjoy spectacular sunsets after fishing, surfing, snorkeling and more.... A holiday to Bali is not complete without experiencing the beautiful tropical islands that lie close to the main island of Bali. Enjoy a luxurious boat charter Bali cruise at sunset while your experienced captain and crew take the responsibility of safely sailing you to a beautiful paradise. Explore the beautiful Indonesian archipelago at your own pace in your own time with a fun filled charter boat adventure. Its an unforgettable experience the whole family will enjoy. WE OFFER A PRICE MATCH GUARANTEE! 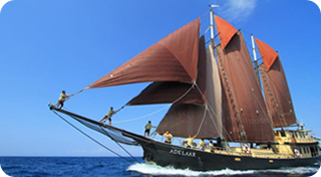 Charter a luxury yacht to cruise the islands near Bali at your own pace. Enjoy fishing, surfing, snorkeling and diving from the luxury for own boat. We offer a range of private charter options suited to families or groups of friends wanting to cruise the Indonesian archipelago. A leisurely cruise with the family is an excellent way to spend a day or a week. 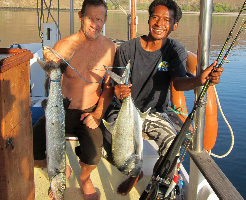 Fishing around Bali is excellent with many types of fish available for all levels of skill and experience.